There’s nothing better than garden fresh tomatoes in August. This is a super easy and scrumptious appetizer I like to make. It’s kind of a melding of two recipes from two of my favorite cookbooks; one found in the Seattle Junior League’s Celebrate the Rain cookbook & the other in the Seattle Junior League’s Simply Classic cookbook. I hope you like it! Gently stir together tomatoes, basil, garlic, parsley, evoo, vinegar,oregano and cheese. Salt and pepper to taste. Brush one side of each bread slice with olive oil. Toast both sides of bread on grill or under broiler of bake at 400 degrees for 4 minutes. 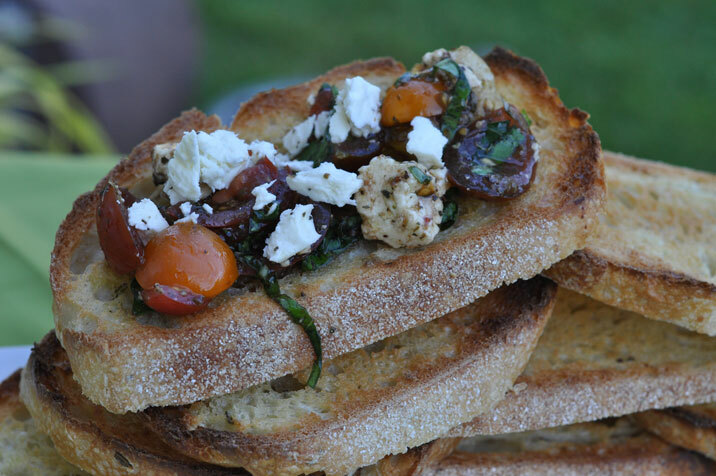 Serve the toasted bread with the tapenade. Previous post: Thank You Argentina for Chimichurri Sauce!